With approximately 45% of employers in Massachusetts offering high-deductible plans this year, chances are you have one or will soon. While the number of people on high-deductible health plans is a big one, the number that knows how to navigate them is not nearly so. Sure there are tools out there that can help you shop, but let’s be honest – they aren’t great and they are actually pretty time-consuming. 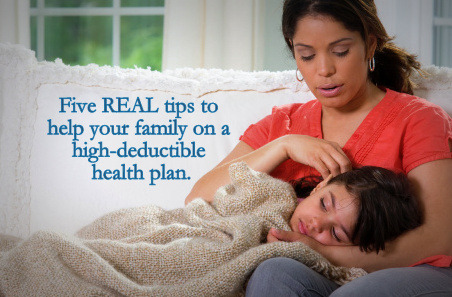 So, here are some REAL tips that can help your family survive on a high-deductible health plan. Ask for a coupon. Sounds funny, right? But doctors often get coupons or know where to find them for medications, particularly the more expensive ones that aren’t fully covered. For example, epinephrine pens (epi-pens) can be very expensive depending on your plan. There is a coupon on their website offering no co-pay or up to $100 discount. Ask your doctor for tips on discounts and coupons for expensive medicine and products. They could save you time navigating for one yourself! Inquire about a discount. Surprisingly, there is often a discount given by your provider for paying on time, upfront, in cash or just because you asked! Make sure to ask the receptionist or billing representative at the time of your appointment. If you forget to ask at your appointment, ask when you receive your bill. They may have a program for a self-pay patient that can be as much as 50% off. Just ask! Tell your doctor. Bear with us as this seems like a no-brainer. But really, that’s the very first thing you should do because just like us, doctors are in a new situation with these types of plans. They aren’t thinking that the patient may have to pay out of pocket and will take this into consideration if you let them know up front. If the situation allows, your doctor may be willing to correspond via email or through the nurse’s line to address questions and concerns instead of having you come in for a visit, saving you time and money. Don’t get a test at a wellness visit. This is something that you may think is saving you money when it really could be costing you. Generally speaking, wellness visits are usually covered under your plan. However, a test like an x-ray, a hearing test or something that is outside of your expected wellness visit or exam, are not covered. If you doctor orders something or performs a test that is not considered part of the wellness visit, you may be charged separately for it. Just because it was during the visit does not mean it is covered! Make sure you ask your doctor before the test is performed. Watch for quality – not just price. This can be especially tricky to manage since most of the new tools out there are strictly focused on price measurement. Using an MRI as an example (because after all, it’s what Shields does best), you want to look at the type of machine used as a primary measure for quality. Shields recommends an MRI machine with a minimum strength of 1.5T strength for the highest level of accuracy and detail. Lower-strength magnets like a 1.2T or 1.0T may not be as detailed and that can compromise the image which is what your diagnosis and treatment plan is based upon. Shields offers a 1.5T or 3T MRI at every single location in the network and provides a low price. That’s a great example of quality and affordability. As high-deductible plans become more common, the hope is that great tools and service will too. Feel free to download Shields' complimentary MRI price shopping tool here.